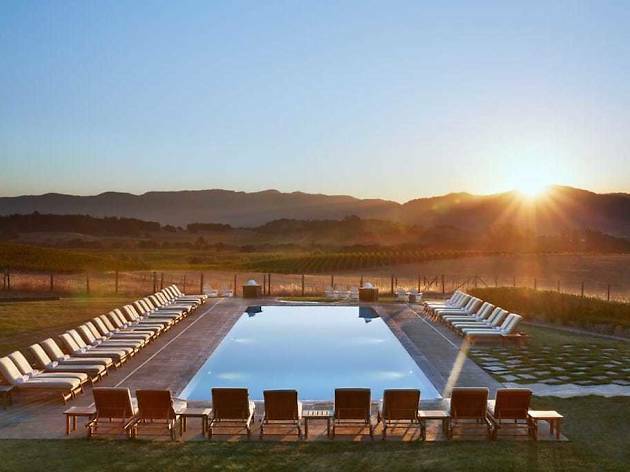 On the hilly border of Napa and Sonoma, this sprawling resort offers luxury private cottages, complete with an outdoor shower and deck. The vibe at this family-friendly resort manages to be sophisticated and relaxed at the same time. 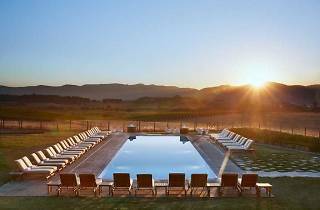 Extensive on-site dining options include Farm Restaurant, the Boon Fly Cafe (their warm doughnuts and Bloody Marys are highly recommended), and a general store stocked with wine and picnic supplies.The resort has two pools, the adult-only pool having stunning vineyard views for ultimate relaxation. Stroll through the on-site culinary gardens or take advantage of the complimentary bike rentals for a sunset ride through the vineyards. Additional amenities include an award-winning spa, a 3,000-square foot fitness center, bocce ball courts, and a large outdoor lounge area. There are extra touches to make your stay even more comfortable, such as WiFi throughout the property, complimentary fitness classes and a “Fireside Butler” to light your fire pit and fill your outdoor tub. Yes, we said outdoor tub. If you never want to leave, you don’t have to; the resort offers ownership opportunities.